Members of the royal family without their own specific standards use the royal standard with a bordure of ermine. This was for instance used by the late Diana, Princess of Wales. Below is a list of standards of members of the royal family, as described in Neubecker (1939, reprinted 1992), provided by Peter Hans van den Muijzenberg, 24 April 2002. A list of standards of members of the British Royal Family that are a version of, or include, the Royal Standard compiled by David Prothero, 23 September 2002, unless otherwise indicated. Quartered : Royal Standard 1st, with Standard of Saxony. 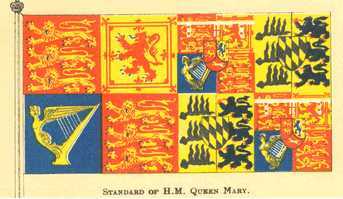 [Royal Standard in upper hoist and lower fly] On the quarters with the Royal Standard, white label with three points, two blank, one with cross of St George. Shield of Arms of Saxony in centre of Royal Standard, White label with three points, all blank. Shield of Arms of Saxony in centre of Royal Standard, white label with three points, two with blue Anchor, one with cross of St George. George, Prince of Wales, [later King George V]. by 1907 - 1910. Shield of Arms of Saxony in centre of Royal Standard, White label with three points, all blank. Shield of Arms of Saxony in centre of Royal Standard, white label with three points; two with blue fleur-de-lis, one with cross of St George. Same, without shield of Saxony. During WWI, the Saxon shield was removed. 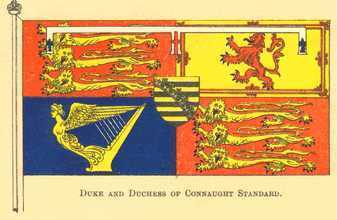 The inescutcheon of Saxe-Coburg-Gotha is on the standard of the Prince of Wales in the 1905 Flaggenbuch. According to my notes the same inescutcheon is on the standard shown in the 1907 Admiralty Flag Book. There was no edition in 1910, but in the 1915 edition the inescutcheon of Saxe-Coburg-Gotha had been replaced by the shield from the Welsh arms. It seems that this happened when George V granted arms to Edward (VIII) Prince of Wales in about 1910, but the inescutcheon of Saxe-Coburg-Gotha continued on the standards of the Duke of Connaught and 'Other Members of the Royal Family' until 1917 when the family name was changed to Windsor. Shield of Arms of Saxony in centre of Royal Standard, white label with five points; three with cross of St George, two with blue Fleur-de-lis. Source: A photograph of Queen Alexandra's standard, that had been carried to the Antarctic by Shackleton, was posted by the BBC in September 2002, when it was being auctioned off. Bottom shield: Quartered by the Cross of Dannebrog 1 Denmark, 2 Schleswig, 3 per fess, in chief Sweden, in base gules, a stock fish argent, crowned or (for Iceland), impaling azure, a buck passant argent (for Faroe Islands), and azure, a polar bear rampant argent (for Greenland), 4 per fess in chief Wends: Yellow wyvern on red, in base Goths: Blue lion over nine red hearts on yellow. Middle shield: Quartered: 1 Holstein: White nettle leaf on red, 2 Stormarn: White swan on blue, 3 Dithmarschen: White mounted knight on red, 4 Lauenburg: Yellow horse head on red. Top shield: Per pale, Dexter Oldenburg, Sinister: Delmenhorst: Yellow cross on blue. Shield of Arms of Saxony in centre of Royal Standard, Ermine Border. Granted in the Reign of King George V. 1910 - 1936. Shield of Arms of Wales surmounted by Coronet in centre of Royal Standard, White label with three points, all blank. Royal Standard and Personal Standard Impaled. Impaled the Royal standard with her family standard. As she is the daughter of Mary Adelaidee, who is the daughter of Adulpus of Cambridge Hanover, son of King George II, the Royal Arms appear as part of that family's half as well, be it with a heart-shield for Hanover, and with a label with three pendants, with two hearts, twice, and a St. George cross. They are quartered with the arms of her father Francis Duke of Teck, I assume, who is a son of Duke Alexander of Wurtemberg: Impaled yellow three antlers and yellow 3 black lions passant langued and armed red, with a heart shield of yellow and black lozenges. The shield itself is Wurtemberg, but what is the heart-shield? All I know is that it looks like the flag of Munich. I guess this suggests that the Royal Standard for England for the house of Hanover, differenced with a white label with three pendants, with two hearts, twice, and a St. George cross, was the standard of Adulpus of Cambrige Hanover, if he had one. All tressures have 8 fleur-de-lys. The 1910-1953 standard of Queen Mary (Queen Mother 1936-1953) is shown in Flaggenbuch 1939 as the royal standard at the hoist with the arms of the Dukes of Teck on the fly. The black lions have the forepaws 'fleshed' or 'flayed', a Württemberg method of differencing applied to the supporters of the Duke of Teck's arms (Fox-Davies, A Complete Guide to Heraldry, 1978 reprint of 1909 ed., Bonanza Books, New York, p. 187). The shield with the black and yellow lozenges represents Teck. See also http://en.wikipedia.org/wiki/Image:QM_standard.gif for a more detailed image, incorrectly sourced to FOTW. Note that this image shows the escutcheons in the Duke of Teck's standard as black and white (not yellow). 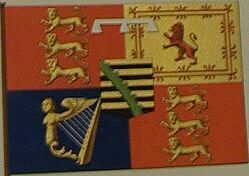 Royal Standard with Ermine Border. Royal Standard; white label with three points, two blank, one with blue Anchor. George, Duke of Kent; [youngest son of King George V]. 1934? - 1942. Royal Standard; white label with three points, all with blue anchor. I seem to recall a photo of the Duke of Windsor's flag (crown on white label for difference) laid on his coffin. Royal Standard; white label with three points, two with cross of St George, one with Tudor Rose. 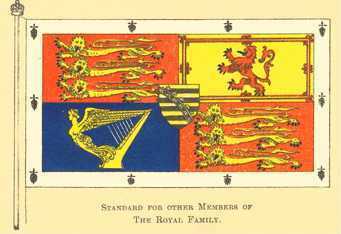 The Royal Standard of HRH The Duchess of Edinburgh (i.e., the Queen after marrying Prince Philip and before she became Queen). This is shown in the records of the College of Arms, and was used I believe on a visit to Canada. It is unusual (in Royal Standard terms) in that the Duke of Edinburgh’s arms are at the hoist, and the Royal Arms, differenced with Princess Elizabeth’s label, are in the fly. Royal Standard; white label with three points, two with Tudor Rose, one with Thistle. 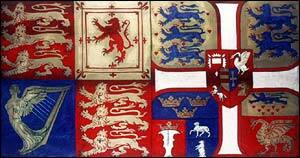 Royal Standard; white label with three points, two with cross of St George, one with red Lion passant guardant. The Royal Standard for England differenced with a white label with three pendants, with anchors, apparently black. However, since the blue in the image is quite dark, and since we know only blue anchors are used, I assume they must be blue. I expect his wife Marina had a standard, combining his standard with that of Greece, but I don't know the details. Royal Standard; white label with three points, all with cross of St George. 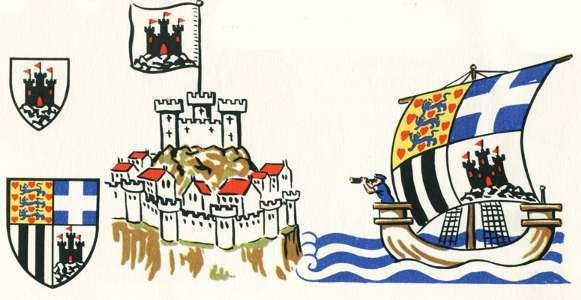 A drawing in "Simple Heraldry (subtitle Cheerfully Illustrated)" by Iain Moncreiffe and Don Pottinger (Thomas Nelson and Sons) shows the derivation of the Duke of Edinburgh's coat of arms, with it whimsically used as a longboat sail. The reference mentions instances where the arms of places derive from people, and this is an instance of where the arms of a place became part of a personal coat of arms - so you have Edinburgh's arms showing a castle, and that same castle as the fourth quarter in Philip's arms. Royal Standard; white label with three points, two with cross of St George, one with red Heart. Royal Standard; white label with five points, three with cross of St George, two with red Lion passant guardant. Royal Standard; white label with five points, three with blue Anchor, two with cross of St George. Royal Standard; white label with five points, three with cross of St George, two with blue Anchor. Royal Standard; white label with five points, two outer with red Heart, two inner with blue Anchor, one with cross of St George. Presumably, following the grant of arms to Prince William and Prince Henry ("Harry") of Wales, they also have royal standards differenced with their labels containing the red escallops from the Spencer arms. I'm inclined to think that the Princes have not yet been granted one. In the 1950 Book of Flags Campbell and Evans wrote, "On the centre point of the [Duke of Windsor's] label is now an Imperial Crown in token of his former rank as King Edward VIII; it appears on the Royal Arms, for he has not yet been granted a flag." This is repeated in the 1969 edition, only three years before he died. It suggests that standards are not granted automatically with arms, and I have seen no mention of a standard for either Prince. I think William and Harry will officially get flags when they start undertaking Royal duties, although technically Harry already has. 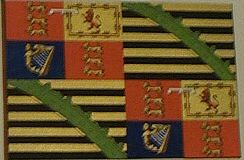 I believe you are right that the grant of a differenced Royal Arms does not automatically give the bearer the right to the same as a banner (as it would for non-Royal Arms), and that a separate warrant is required from the monarch. I remember discussing this Royal peculiarity with the heralds a couple of years ago. As far as I know, the design of the flag never varies from the arms, so we know what William and Harry’s flags will look like, even if they are not meant to use them yet.